From the girls' Barbour International collection, the Viper Quilt teams the signature diamond-quilted outer with a cosy fleece lining. 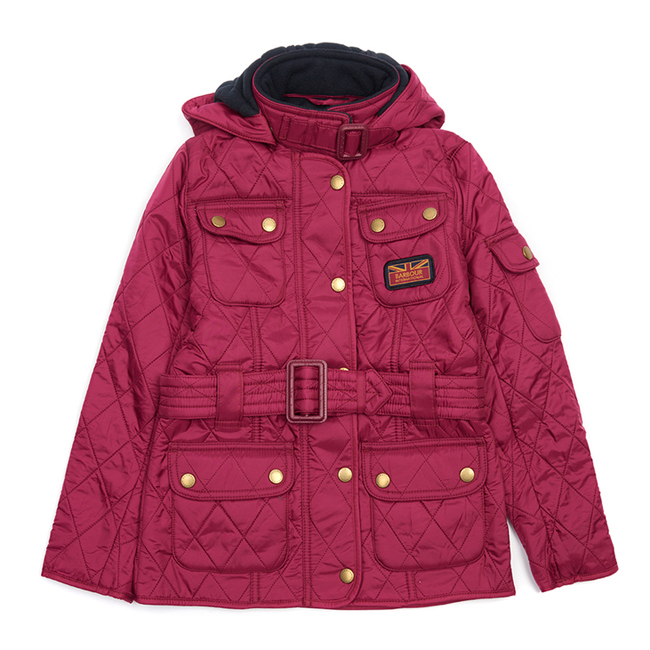 This thermal jacket is a practical and stylish addition to any girl's winter wardrobe. Its fleece-lined funnel collar features a throat strap that can be fastened shut for extra protection, while a large detachable hood is on hand to defend against downpours. Four stud-fastening outer pockets create the classic biker-jacket look while offering plenty of room to stow away essential little items, and a waist belt adds a grown-up touch. The Viper is machine washable, for added everyday convenience. Nice jacket. It's pretty thin and light. Good for rain but wouldn't recommend for winter. Also be careful about the color. Looks red in the picture but pink in real life. great quality for the price and is made in britain! that should be a selling point!